Do you work at The Railway? A picturesque pub with good value food and drink. The Railway is curiously positioned next to the London-bound platform of Kew Underground station, which is, in reality, overground. Leather sofas and stout wooden tables look out over platform two allowing legitimate staring for the inquisitive. The botanical garden-style glasshouse roof and walls silently shield the rattly District Line trains. On the other side lies a delightful village view of Kew. 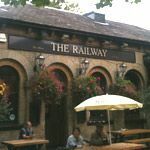 In reality, The Railway is a pub; however, the eating area is light and airy and reminiscent of a chaotic family conservatory. There is a separate long dark bar for drinkers and benches outside for those with dogs. The larger international rugby games are screened and one or two animated supporters pop up. Place your order at the bar, pay up and find a seat. Expect familiar English fare of fish and chips, and burgers. The food is perfectly rationed and delicately cooked. No grease or guilt taints the superior ingredients. The chunky chips and fish have been lightly deep fried in a subtle beer batter. The chicken burger is particularly recommended, succulent and nestled in a soft floury bap surrounded by crackling lettuce, onion and tomato. Bottles of Heinz tomato ketchup and HP Sauce add a home cooked flavour. Solid crockery and cutlery lend a homely feel. Order your drinks with your food and carry them to your table. On tap you'll find Youngs, Strongbow, Guinness, Becks, Green King and Adnams. Bottles of wine begin at £10 for the house red (a Malbec) and end at £20 for a Chablis or Shiraz. White wines are stocked from popular regions and include Chardonnay, Trebbiano, Pinot Grigio, Chenin Blanc and Sauvignon Blanc. The same can be said for the reds with Merlot, Cabernet Sauvignon and Cote de Rhone all on the list. Local pub prices for drinks and less than ten pounds for a satisfying main meal. Great for fuelling a stroll through Kew Gardens.